As strange as it may sound, this United Express EMB-120 was the motivation for creating a template for this aircraft in the first place. 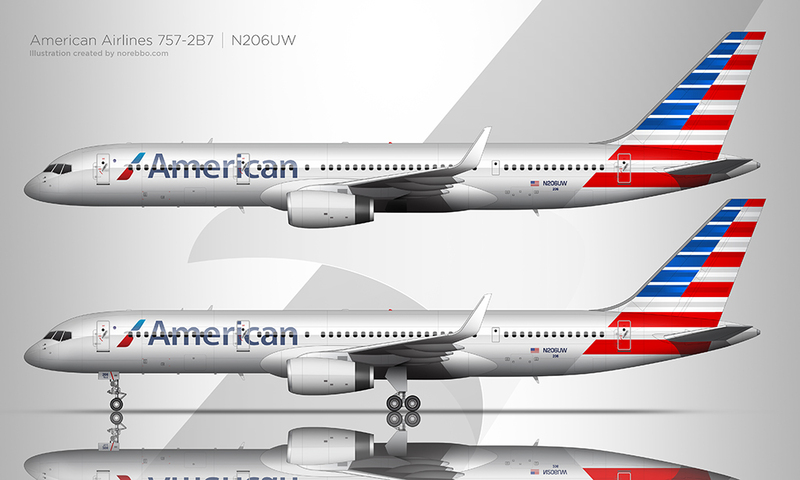 I know it isn’t the most exciting thing that I’ve ever illustrated, but I needed this airline/aircraft combo for a personal side project that has been neglected badly as of late. It feels good to be scratching items off my to do list! Introduced by Pentagram in 1998, this blue “tulip” livery was never a favorite of mine. The contrast between the upper and lower sections of the fuselage makes the aircraft look bottom-heavy, and I’ve always thought that they should have incorporated that dark color higher into the fuselage. But we all know how badly dark-painted aircraft fade just after a few years, so I guess it was a smart idea to keep the top portion white. 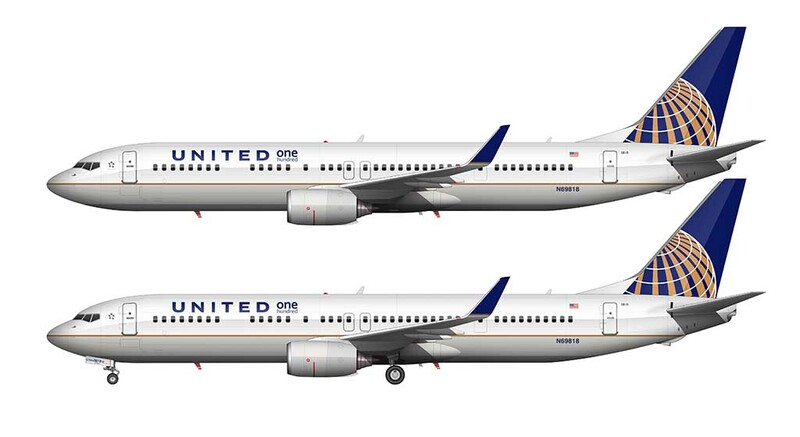 Especially since the United livery that preceded this one was dark gray (commonly referred to as the “battleship gray” scheme), which was starting to look downright horrible on many aircraft in their fleet by the time this livery was unveiled. I think they learned their lesson on that one. My favorite look on this little Embraer has to be the bare metal SkyWest and Comair liveries that seemed to be everywhere in the late 1990’s. I’m convinced that a livery featuring generous amounts of bare metal can make any airplane look good – even this Brasilia! These are complex machines after all, and exposed aluminum really emphasizes all the cool little details. 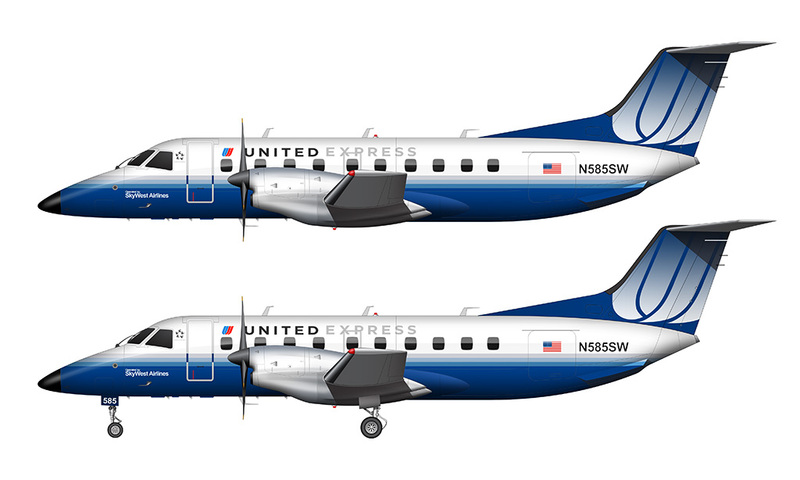 Anyway, that side project I mentioned above is in need of two more EMB-120 illustrations: a United Express version in the battleship gray livery, and the bare metal SkyWest scheme. I’m not sure how soon I’ll get to those but you can bet that I’ll post them here once I finish. I absolutely love your work! I was wondering though, how do you make the liveries? I use GIMP 2, and i cant seem to figure it out. Any help would be appreciated! Thanks for the compliment! I’m not familiar with GIMP, but in photoshop it’s really easy: Each element/color/graphic should be on it’s own layer, and from the blending mode dropdown menu (located at the top of the layers palette), select “Multiply”. This will make the layer fully transparent allowing the shadows and the textures of the aircraft illustration to show though. I assume GIMP has this sort of functionality somewhere – “multiply” blending modes are common across most graphics and design software packages. What about making the logos? im sorry, im really new to this. No problem – the logos are probably the easiest part! If you need a real logo of a real airline (and you are just doing this for yourself and not a commercial product), there are tons of websites with logos that you can download and use for free. However – I’m a bit of a perfectionist and I find nearly all of those “free” logos to be not very good quality. I usually make my own from scratch. If you want to do that, the best thing to do is to find the cleanest version of the logo you can find and then trace it in a vector drawing program such as Illustrator or Corel Draw. Once complete, you can copy and paste it into Photoshop/GIMP/whatever to apply to the illustration. Anyway, the best thing to do is tinker and experiment for yourself. I’m completely self-taught by the way – I just started playing with Photoshop and Illustrator (years and years ago) until I found a workflow that suited my needs. You’ll get there!